Philip Henry Sheridan was born in Albany, New York on 6 March 1831. He graduated from the United States Military Academy in 1853. Before the Civil War, he served with the 1st Infantry and the 4th Infantry. In 1861, he was promoted to first lieutenant and then captain. He became the quartermaster of Major General Henry W. Halleck’s headquarters until 1862. Sheridan was made a colonel of the 2d Michigan Volunteer Cavalry and commanded a brigade in Mississippi. After the battle of Boonville, Sheridan was promoted to brigadier general of volunteers. He fought at Perryville and Stones River. By the end of 1862, he was a major general of volunteers. He next fought at the battles of Chickamauga, Chattanooga, Wilderness, Todd’s Tavern, Yellow Tavern, and Trevilian Station. In 1864, he became a brigadier general and then a major general in the Regular Army. 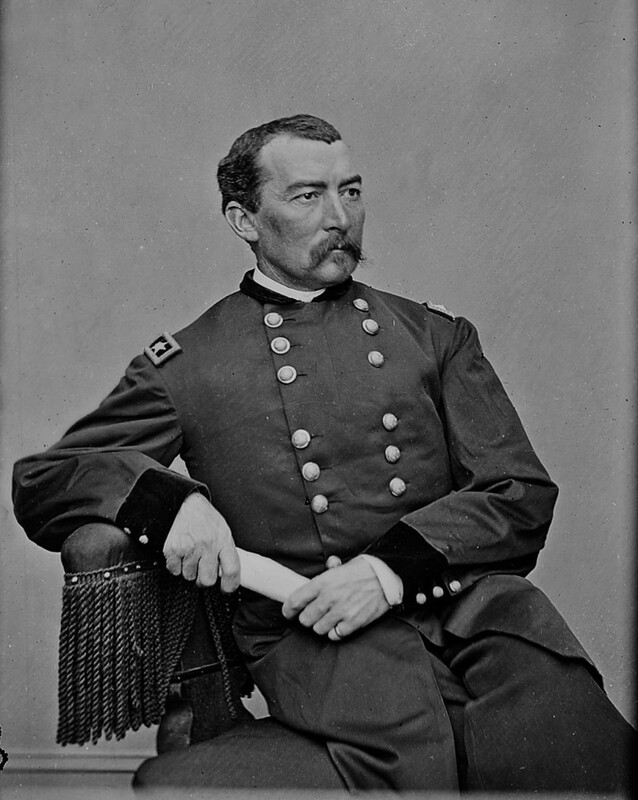 Sheridan commanded the cavalry at the closing battles of the Civil War, including Five Forks and Appomattox. After the war, Sheridan commanded various departments and divisions before he was promoted to lieutenant general in March, 1869. From 1870 to 1871, he traveled to Germany to study. He married Irene Rucker in 1875. From 1 November 1883 to 5 August 1888, he was the commanding general of the Army. As commanding general, Sheridan urged Congressional support of the National Guard, helped buttress coastal defenses, and sought a resolution to senior officer authority problems. Sheridan was promoted to general in 1888 and died later that year, on 5 August, in Nonquitt, Massachusetts.